As was foretold in the days of yore (or, you know, the fact that all Marvel blockbusters get accompanying Lego), five new Lego sets for Avengers: Endgame have been revealed. Available now and with prices ranging from $20/£20 to $100/£85, they hint at some intriguing storylines to come. Although you should always take kit scenarios with a pinch of salt, they’ve been known to unveil plot points in the past. So: possible spoilers inbound. Still here? Cool. While a few of these sets are generic fight sequences (Cap riding a tricked-out motorcycle into battle, for instance), there’s also a kit that sees Thanos and his minions attack the Avengers compound in upstate New York. It’s not an isolated incident, either; this seems to be a running theme. Based on contents and cover art, at least three of the five kits feature Outriders (those four-armed monsters from Infinity War) invading what would appear to be Avengers HQ. As an aside, Thanos is also seen wielding a hammer in the ‘Marvel Avengers Compound Battle’ kit. This reinforces our suspicion that his Infinity Gauntlet is on the fritz (I mean, we’ve all been there). Is this a scene from the movie, then? Maybe. On the one hand, it could be a coincidence because the Avengers compound features so heavily in every trailer. On the other, the naming and scenario of ‘Avengers Compound Battle’ is suspiciously specific. What’s more, there’s a shot from the second trailer of the team looking in shock at the sky outside. Although this is likely to be Tony and Nebula arriving back on Earth, it could just as easily be the start of an assault by Thanos. But why would he go there? Your guess is as good as ours. Perhaps the Mad Titan has cottoned on to the Avengers’ plan? Maybe he wants their directions to that wicked shawarma shop? Either way, these sets are pretty awesome. They also imply that we may get a Hulkbuster version of the War Machine armor, and that’d be dope. You can see each Lego kit and their official descriptions below. And for more theories about the MCU finale, check out the best Avengers: Endgame theories explained, analysed, and explored. Take on 3 Outriders with Captain America’s bike! Fight back with the Captain America shield shooters. Emergency! Ant-Man is under attack by the dangerous Outriders. Fly to the rescue with the mighty War Machine Buster! Fire the 6-stud rapid shooter and the flick missiles. Grab an Outrider with the massive mech’s powerful hands. 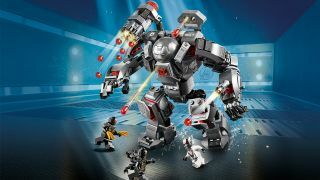 Then detach the stud-shooting cannons and battle the enemy on the ground with War Machine! Get set for battle against the Chitauri with the Avengers Ultimate Quinjet! Prepare the weapons with Rocket and Thor in the passenger compartment. Jump in the cockpit with Black Widow and take off. Fire the stud shooters and the 6-stud rapid shooter. Team up with Iron Man, Captain Marvel, Hulk, Nebula and Ant-Man and defend the Avengers’ compound! Make plans in the office and grab weapons from the table’s secret compartment. Monitor Thanos and the Outrider’s approach to the Avengers HQ with the radar, then speed into action!